Scottish Wild Mushroom Code – Wild mushroom, what and how to collect? 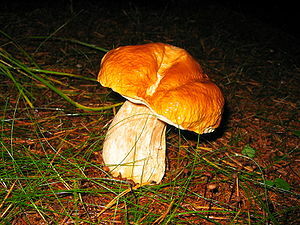 Wildlife, especially insects, need mushrooms too, so only pick what you will use. Some mushrooms are poisonous and others rare and should not be collected – only collect what you know and take a field guide with you to identify mushrooms where you find them. Some species are vulnerable, so please consider whether there is an alternative species that is more common that might suit your purpose. Allow mushrooms to release spores, do not pick mushrooms until the cap has opened out and leave those that are past their best. The main part of the mushroom is below the surface; take care not to damage or trample it and not to disturb its surroundings. Scatter trimmings discreetly in the same area as the mushroom came from.